Bruce Schultz is the man behind the camera. He’s wearing a black apron over his work clothes, and his wiry grey hair is barely contained by a flat tweed cap. His camera is a replica of an 1850s model, and the lens is actually from that era, something he bought on the internet. It’s the same rig he uses for making tintypes at Civil War reenactments and old-time festivals. On this night, he’s set up in New Orleans, just off Frenchmen Street at the Scott Edwards Gallery, making photographs by appointment for anyone who is interested. Turns out, plenty of people are interested, and Schultz gets all the work he can handle for the two-day stint. “Most people have never seen this done, so it’s always fun to see people’s reactions,” says Schultz. “But pictures don’t lie, and sometimes people don’t like that. Pictures may not lie, but modern photography can certainly stretch the truth. With wet plate photography, you only get one shot, which can be frustrating for people accustomed to picking out the best snapshot from multiple takes and applying Instagram filters or using Photoshop magic to make everything look perfect. It’s that kind of digital perfection that Schultz gave up in 2007, when he first started experimenting with wet plate techniques. At his day job, Schultz works digital. He’s a photographer for Louisiana State University’s College of Agriculture, taking pictures of scientists, crops, 4-H kids, award winners, basically “whatever they need pictures of.” He takes a lot of them, always making sure he has just the right image edited and ready to go for the AgCenter’s communications department, but when he’s off the clock, Schultz takes the long way around. Wet plate photography is part art, part alchemy, a time consuming process that requires blackened metal plates, silver nitrate, and a thick syrupy liquid called collodion. It takes about a half an hour to shoot and develop a single photograph. Schultz revels in the technical process, and he’s continually awed by the product. Schultz has found a captive audience for his work. For Civil War reenactments, he travels throughout Louisiana, Mississippi, Missouri, Virginia, and beyond, setting up his tent in places like Brice’s Crossroads and Champion Hill to capture images of people who devote themselves to the hard life of a simpler time. Schultz does his best to keep things “period correct.” He wears a frock and a top hat, and he travels with a small cart with wooden wheels. If he has to use anything plastic, he does his best to keep it out of sight. He also takes his gear to old-time music festivals like the Blackpot Festival in Lafayette, Louisiana, that celebrates Cajun culture, and the Appalachian String Band Festival in Clifftop, West Virginia. Like the reenactors, many musicians are dialed into the aesthetic of the period, and some have used Schultz’s images as cover art for their albums. While these pictures are authentic tintypes, they're still reminiscent of something from an old-time photo booth--the kind of place found at fairs and amusement parks, or on the main streets of Pigeon Forge and Branson--where tourists dress up like cowboys and dancing girls and pose in front of a painted backdrop. Schultz's work transcends the quality of those sepia-toned prints, and Civil War reenactors commit to a level of detail that goes beyond playing dress-up, but there's still an air of novelty to the images. Schultz, however, sees it as something more. Those pictures, it’s worth noting, are now finding a place in galleries and museums. 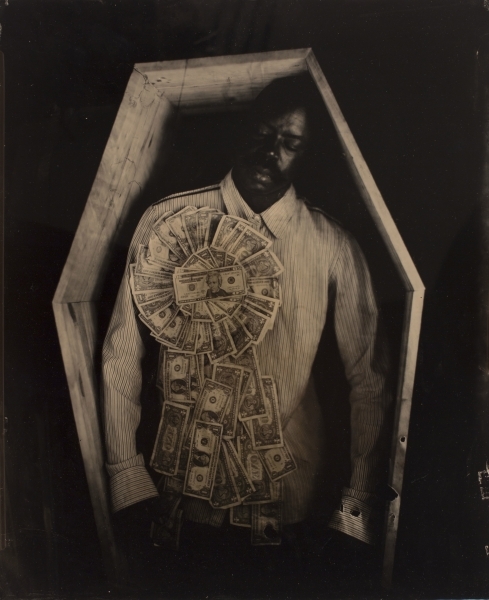 Schultz is represented by the Scott Edwards Gallery, and his collaborations with New Orleans artist Kevin Kline have been shown at the Homespace Gallery in the city’s St. Claude neighborhood and at the Ogden Museum of Southern Art. Over the last year or so, Schultz worked with Kline on a series of photographs Kline calls A Stranger to Me. Kline started the project on film, but after meeting Schultz at a photography workshop, he enlisted his help in capturing the images as large-format tintypes. In wet plate photography a big picture requires a big camera, so Schultz repurposed a red dome tent normally used for ice fishing, turning it into a giant camera. 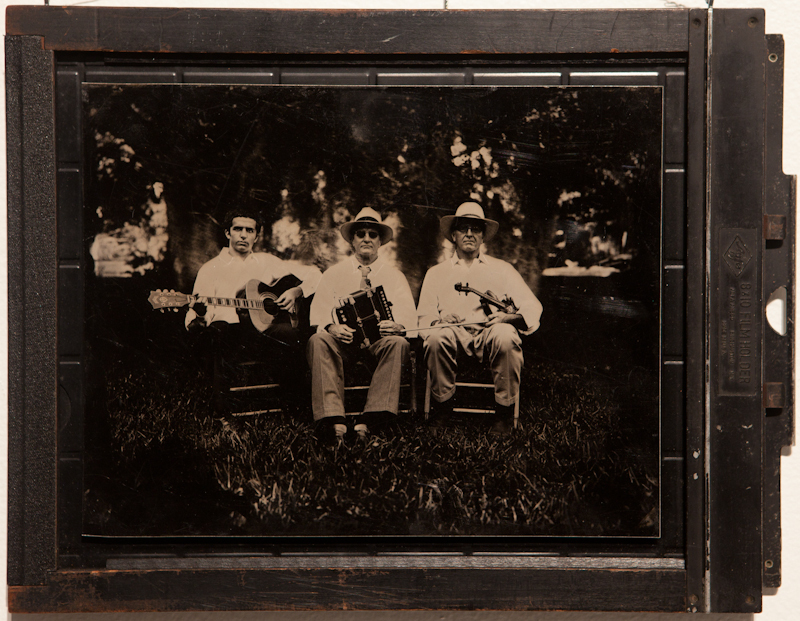 The resulting images are nearly two feet square, enormous dimensions for wet plate photography. The series is directed by Kline and features portraits of Kline's partner, Brian. The photographs are sexual in their intimacy, and intimidating in their strangeness, recalling the work of photographers like Robert Mapplethorpe and George Dureau. In an artist statement, Kline writes, "With this work, we are exploring the idea of trying to know someone---the feeling of knowing them well, and then at times, not at all." Schultz doesn't have much to say about his collaboration with Kline, other than giving Kline full credit for the creative ideas in the work and calling himself simply “the technician." For Schultz, the joy is in the making of the work, regardless of the work he’s making. He leaves the labels to others. Bruce Schultz' work can be purchased through the Scott Edwards Gallery. The entire A Stranger To Me series by Schultz and Kevin Kline can be viewed here. Brad Rhines writes in New Orleans, LA. Follow him on twitter.